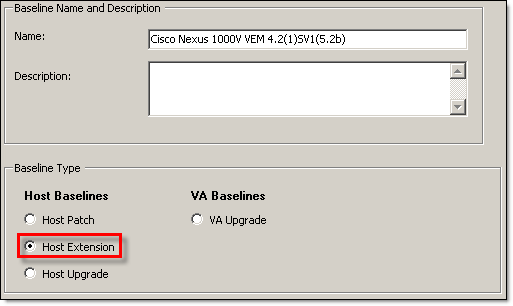 These instructions will be for Cisco Nexus 1000V Release 4.2(1)SV1(5.2b). Confirm the upgrade version and click Finish. The patch has been added to the Patch Repository. Confirm Host Extension version and click Finish. Assign newly created Baseline to host/cluster/Data Center and install VEM upgrade following standard host remediation procedure. Save the running configuration to the startup configuration. Copy the Cisco Nexus 1000V kickstart and system images to the active VSM. You can use ftp:, tftp:, scp:, or sftp:. Verifying image bootflash:/nexus-1000v-kickstart.4.2.1.SV1.5.2b.bin for boot variable "kickstart". Verifying image bootflash:/nexus-1000v.4.2.1.SV1.5.2b.bin for boot variable "system". Extracting "system" version from image bootflash:/nexus-1000v.4.2.1.SV1.5.2b.bin. Extracting "kickstart" version from image bootflash:/nexus-1000v-kickstart.4.2.1.SV1.5.2b.bin. Notifying services about system upgrade. 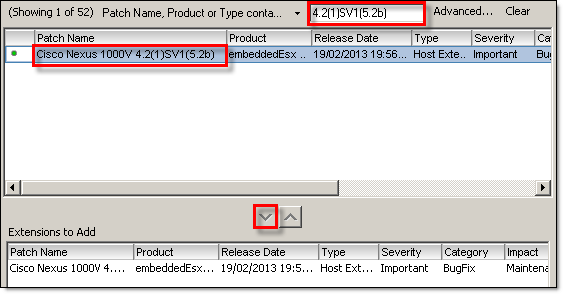 Make sure the impact of VSM module upgrade is ‘non-disruptive’ and upgraded VSM is compatible with VEM and ESX version. Continue with the installation by pressing Y, if you press N, the installation will be aborted. Install is in progress, please wait. Syncing image bootflash:/nexus-1000v-kickstart.4.2.1.SV1.5.2b.bin to standby. Syncing image bootflash:/nexus-1000v.4.2.1.SV1.5.2b.bin to standby. Module 2: Waiting for module online. Notifying services about the switchover. After upgrade completed, log in and verify that the switch is running the required software version. Great read, very much appreciated.